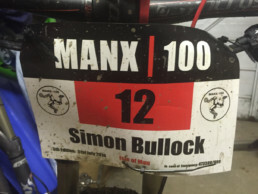 My interest in the Manx 100 mile mountain bike event has only been by association in the past, having had friends that have attempted it, won it or just pointed it out as a future calendar event, in a moment of madness I entered it last year on the first day of entries for the 2016 event then put it to the back of my mind!! The panic only set in after reading a few competitors blogs at the end of January, so to throw a marker in the sand for my fitness i went our for my first ride of 2016, a 100km raid from my home in Shap over the dales and back in some typically cumbrian weather. Humbling but glad to get a solid few hours in the saddle with a good few months to build some form. The intervening months have seen me riding some amazing trails in the North of Scotland at Easter, dragging Em around a bit of an epic Glen Affric ride, ooops! Riding the first gravel race in the UK the Dirty Reiver 200km in April, getting around all but one of the 7 stanes mountain bike routes in order to hone skills, as well as joining the very eccentric but wonderfully welcoming world of Audax riding, getting some stunning 200km road rides in to my plan with lots of likeminded cyclists, plus a coast to coast in a day ride with the Open Cycling guys. So the riding bit was kind of done, but it never feels like enough, planning done, b&b in Douglas booked, ferry sorted from Heysham with just Me, Em and the bikes booked on, pretty liberating stuff arriving with just a rucsac full of kit, plenty of Mountain fuel and a well prepped bike. First trip to the “Rock” and it was all shaping up nicely, good weather, super friendly people, good food, especially the ice cream, all that was left was to follow a 100 mile mountain bike route around an island that measures roughly 30 miles by 12!! Needless to say the route looked akin to a toddlers finest scribblings, but within the scrawl was an excellently thought out route, designed to ruin many a mountain bikers resolve whilst taking in as many hills and trails as the Isle of Man could offer. Registration involved the usual signing on, picking up the spanky race number with an embedded timing chip, and unusually picking up some special Manx 100 beer along with dropping off bag drops that would become key to getting me round the full course, with bottles of mountain fuel, energy bars, the odd sandwich and the essential percy pigs for the final drop at 80 miles. Meeting at the TT grandstand at dawn was a fairly surreal experience in itself, especially as I arrived uncharacteristically early, due to a mix of excitement and over zealous seagulls waking me at 4, it did allow me to see the field rolling in one by one to gather for the roll call, thousand yard stares a plenty but also a bit of chat with some fellow riders about what lay ahead. A quick briefing from Nigel, the sadist that put the event together and then at 6:30 am we were off, following a police motorbike leading us out in a fairly tight pack (for mountain bikers) of buzzing tyres, from skinny racers tyres to a couple of fat bikes, all with the same goal of navigating round the route ahead to end up back at the grandstand at who knows when. In a very short time we turned on to the first off road section, up the first climb of the day, lots of deep breathing, excited line swapping, gear crunching and a bit of friendly banter, it was a weird feeling, a race for some to get to the finish line first but for me and many others it was a race to reach the cut offs in time to enable us to complete the route. Early nerves subsided as i got in to a nice steady rhythm on the climbs and tried to enjoy the descents whilst still feeeling fresh. Chatting to fellow competitors, sharing cheery hellos with all the friendly marshalls and looking ahead for the next arrow that would take us to who knew where! Ah yes, The Baltic. This is the hill people talk about most of all. ‘Baltic’ is a word used in certain parts of Scotland to mean “absolutely bloody freezing”, quite appropriate as it turns out. From the village it starts innocently enough, a gentle tarmac climb winding it’s way up. One of the locals who lives on the lower slopes of the hill always leaves a hosepipe out for us, in previous years this was a most welcome spot to refill our bottles but this year it was somewhat redundant. Having battled down into Ballaugh, pedalling as hard as I could downhill to make any sort of speed into the headwind I had been looking forward to flying up The Baltic with the benefit of a similarly impressive tail wind. However, the wind on the Isle is quite bizarre, during the course of the whole day, despite wiggling around all over the place on a route which was ultimately a loop I never once felt like I had a tail wind. Anyway, I kept plugging away up The Baltic. The short tarmac section soon ended and I was onto the LandRover track above it. Although the wind was still as strong as ever the fog had lifted, which at least made navigation a lot easier, it was now actually possible to spot some of the signs before I passed them. I could see another racer in front of me, probably half a mile ahead, way up on the hillside. I could catch him. I dug in, looking for the lines with best grip as I picked my way up through the slippery wet rocks. The wind was getting worse the higher I got, the shape of the hills funnelling it down towards me. It was tough, but I was gaining. I looked up again, he was off his bike and pushing, I could do this. The wind was still getting stronger and stronger, I was down in my granny-ring, 24t, trying to make progress as best I could. The track turned slightly to the right and what had been a head-wind became a cross-wind. It was blowing me to my left, hard, with sudden gusts of very hard. Keeping the bike in a straight line through the rocks and ruts was getting more and more difficult, every time I was blown off line getting going again was becoming harder and harder. I realised why the rider in front had been pushing, and I was forced to concede defeat and also begin walking. The fog had closed in again by this stage and I had long since lost sight of anyone else, it was just me, alone in the middle of nowhere, head down against the wind, trudging upwards though the murk. I was starting to freeze, the relentless rain had soaked me right through and now I was moving even more slowly I wasn’t generating enough of my own heat. I eventually reached the crest and was able to get back on the bike. I plugged on, upwards, through the fog, my frozen hands curled tightly around the bars, the wind seeming to come from all directions now. After what felt like an eternity I reached what felt like a little plateau, I was knackered, I needed food. I stopped, and reached into my pocket. I had already eaten my supply of Torq bars and gels but I did still have a packet of Shot-Blocks left, that would do nicely. The only trouble was opening it with wet gloves which don’t grip and frozen fingers which don’t bend. I tugged helplessly at the wrapper for a bit, no good. I crouched down, trying to use the heather for what little shelter it would give me, turning my back to the wind. I removed a glove. The fog parted for an instant and I realised where I was, the course doubled back on itself and I was passing the other side of Checkpoint 4. I could see the marshal, still out there huddled in his massive waterproof, trying to use his truck for shelter, two riders plunging down the hill towards him. The rearmost rider left the ground briefly over one of the tussocks and appeared to get blown quite a way to his left before he hit the ground again. His front wheel dug in, flipping him off the front of the bike, which cartwheeled a couple of times before coming to rest, I even heard his cry over the wind. The guy at the front stopped and turned, the marshal already up and moving towards the fallen rider, who sat up, looking surprised and shouting “I’m fine, I’m fine”. The lead rider set off again and I returned to trying to open my food as they all disappeared back into the fog. Someone passed me as I crouched there, asking if I was OK. “Everything’s fine” I lied and then he too was gone. Eventually the wrapper relented and I crammed the lot into my mouth. I stuffed the wrapper back into my pocket and attempted to pull my glove back on. It was cold, properly cold, much, much colder than it had been when I removed it a minute before. Do gloves suffer from wind-chill? My fingers still wouldn’t bend and it took a while to force them back into it. Getting the glove back on made them no warmer at all. I had stopped at the top of the hill as, despite the extra wind there, it is always much easier to get going again when setting off onto a downhill. Well, not quite always. If there is a huge head-wind it is as just as hard as going uphill. Down the hill back to Sartfell. Last year this was where the 100 mile and 100km events separated and there had been a big gaggle of people here. Today there was nothing, no-one, just wind, fog and an abandoned truck. It was a long, hard ride over the moors, around the appropriately named Colden Hill, nearly as appropriately named as The Baltic. I even managed to catch glimpses of it as the fog was thinning slightly. As I headed down Braaid towards Checkpoint 5, the second bag-drop, something most unexpected happened. I arrived at the Checkpoint 5 at 1532, nearly six hours since the last bag-drop, soaked to the skin and frozen, but in good spirits, it’s amazing what the slight of a small patch of blue sky can do. I found my bag and it’s precious contents of a dry base layer, a new waterproof and, most valuable of all, new gloves. It was a huge relief. I ate most of the rest of the contents, stuffing the remaining Torq bars and gels into my pockets. The marshals there were lovely, if slightly bemused by what we were all doing. One of them even gave me her cup of tea, just being able to hold something warm for a minute was a huge boost for my poor hands. The significance of Checkpoint 5 was that it was where the 100 mile and 100km routes diverged and I had to make the choice. Opting for the 100km would mean a three mile pootle back into the centre of Douglas via a nice easy route, back to the Grandstand, tea, cakes and warm showers. Opting for the 100 mile route would mean another 40 miles of what I had just been through. There was a short section of the TT course heading towards St John’s before climbing 500ft up in less than a mile to Dowse. To make it all the more fun the rain was back, although mercifully without the fog this time. I remembered the descent down into the village from last year, this was where I had performed a frontal dismount and landed heavily on my knee. I decided that discretion was the better part of valour, and that cowardice was the better part of discretion and so I valiantly dismounted and ran down it this time. Riding into the village I was delighted to see Gina waiting for me on Tynwald Hill in the drizzle, the original site of what is now the world’s oldest parliament. She was carrying hot pasta, a flask of hot chocolate and some cake. I ate and drank all of this and then, feeling much warmer, set off again. The rain returned with a vengeance as I emerged from the plantation at Slieau Whallian onto the open moors before heading back into the relative shelter of Arrasey. My front brake on the other hand seemed to have departed. I could feel, and indeed hear, the pads make contact with the disc as I pulled helplessly on the lever but this seemed to have very little effect on my speed. I had two spare sets of the Alligator pads in my pack, but really didn’t feel like stopping to change them. This was partly because this would again involve removing a glove, something I was keen to avoid at all costs after my experience at the top of The Baltic, but mainly because I knew I was cutting it very fine if I was going to make the checkpoints on time. I had received an update from Gina when I had seen her. A lot of riders had pulled out where the route split, some just having completely lost the will to live, a greater number being pulled out as they simply wouldn’t make it round the route in time. I was now the last rider still out on the course. I had no idea how far behind I was but I knew that I had to press on to get through the cut-offs. After many an hour of riding, slogging up the hills with the reward of some phenomenal if not tricky descents I hit the half way mark and the chance to stop and enjoy some “real” food, a chat with some fellow riders, but all the while overlooking the stunning scenery of the North of the Island. It was only at this point that i became acutely aware of the race i would be undertaking, to stay ahead of the dreaded cut off, at 50 miles i had nearly 2 hours leeway but fatigue and mechanicals could soon erode this buffer. The goal now was to get to the 80 mile cut off, not least because I had more mountain fuel, a ham sandwich and some percy pigs waiting, but also if i got there in time i could be fairly certain to finish. The only thing that stood in my way was the ridiculously stubborn Manx scenery of steep rocky technical climbs, and steep technical descents, but I pressed on, driven by the thought of how good the ham sandwich was going to taste. 20 minutes to spare, that sounded tight, wolfing down my sublime tasting sandwich, i stuffed percy pigs in to my jersey pocket, exchanged the empty bottles on my bike for full mountain fuel filled bottles and pressed on. The next 5 miles despite being excellent trails were probably the lowest point of the day for me, having been overtaken by at least 5 riders at the bag drop i felt sluggish, desperate to catch people but unable to put the effort in to get the wheels moving at pace again, but experience has taught me that this happens after taking on lots of food and just pushing on will get me through it. And it did, after another few miles i caught and overtook two of the riders from earlier and started to feel stronger than i had for most of the day, starting to enjoy some of the final bits of natural trail, overtaking a couple of other riders, pushing hard on the tarmac sections, enjoying some stunning views over Douglas to the finish line, demolishing Percy pigs as I went. Then it was all over, I rolled up to a painted white line on the gravel with some smiley folk congratulating me, 102 miles, 14hrs 22 minutes of riding, just shy of 5000 metres of ascent, 7 bottles of mountain fuel, numerous chia charge bars, sandwiches and a pack of Percy pigs got me 34th out of 43 finishers, with a large number of DNF’s or riders that cut on to the shorter route. A truly epic day out on the bike and one of the hardest rides I’ve ever done, happy to finish, and to have been part of such a fantastic event, superbly organised and supported all the way by the locals out on the trials. Thank you to all who contributed to getting me round this course, #mapdeccycles #arragonscycles #arragonscumbriantriclub #freestylefitness #mountainfuel #chiacharge. 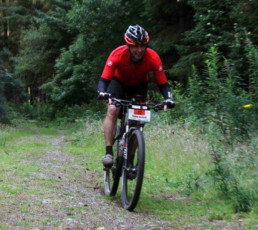 If your in need of a big challenge on the mountain bike it is a must do event.